Park St Trio : 3 Plus 5. Catchy, melodic jazz for all occasions. 3 Plus 5 is an adventure album, a blend of modern-leaning jazz. The songwriting reflects the band's evolution and range of musical interest, moving the listener along a spectrum of sounds from fun and whimsical to reflective and moody. Like Goodnight Daylight, the first Park St. Trio album, 3 Plus 5 was recorded to 1-inch tape with no overdubs and no "fixing" of notes - on this album, what you hear is what they played. In the studio the band did three takes per song and selected their favorite one. The trio has five extra players join them in bringing to life this musical conception. 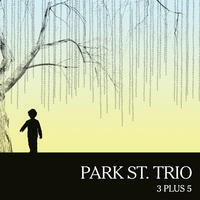 License Catchy, melodic jazz for all occasions by Park St Trio for your project. Play the music of Park St Trio in your restaurant or store. The Almanac by Shira Kammen: early folk and celtic music.